Impervious surfaces are areas that impede the infiltration of water into the soil (rooftops, driveways, parking lots, roads, severely compacted soil, etc). When it rains, water flows over impervious surfaces and is directed to a waterway or into a stormwater drain/inlet. As the water travels, it picks up debris, dirt, pesticides, excess nutrients from fertilizers, litter, pet waste, fluids from leaking cars and other pollutants. Stormwater drains are connected to a series of underground pipes that lead to streams or rivers. These systems are not designed to capture debris or treat the water as in a sanitary system that leads to a wastewater treatment plant. Thus once the runoff enters the stormwater system, it travels unfiltered and untreated directly to local waterways. This pollutant load is harmful to the aquatic environment and degrades the stream’s water quality. In addition, the sudden surge and velocity of runoff during a storm event causes stream erosion, floodplain degradation and possible flooding. Another alternative approach to stormwater management is a rain garden. 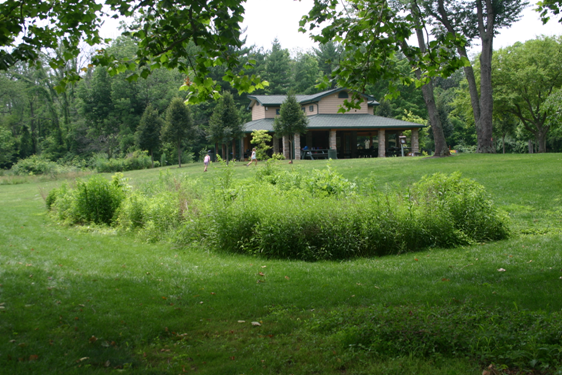 A rain garden is a shallow depression located near a source of runoff that is planted with deep-rooted native vegetation. Native plants slow the flow of stormwater from impervious surfaces and allow the runoff to slowly infiltrate the ground. Rain gardens are designed to withstand high concentrations of nutrients, specifically nitrogen and phosphorous, that are common in stormwater runoff. Prime locations for rain gardens are near downspouts, driveways, sump pump outlets or in the path of stormwater flow through a yard. Gahanna residents are eligible to participate in Franklin Soil and Water Conservation District’s rain garden cost-share program. Reimbursement up to $250 for plants, mulch or compost used in in the rain garden will be provided after an on-site visit from a FSWCD representative to verify that the rain garden has been completed. All plants must be planted and the original receipts from plant, mulch or compost purchases must be submitted in order to receive the reimbursement. A limited number of grants are typically available each year. Contact Sara Ernst at 614-486-9613 to see if funds are available and to review an application for Gahanna. The GreenSpot Community Backyard Conservation Program promotes rainwater harvesting and infiltration through the use of rain barrels and rain gardens, while introducing residents to backyard conservation practices (including composting, using native plants and trees in landscapes and maintaining lawns responsibly). Keeping rain where it falls and using it as a resource keeps watersheds healthy and safe. This program is available to City of Columbus residents, participating municipalities (such as Gahanna) and Franklin County residents who register to be a City of Columbus GreenSpot member. The GreenSpot Program offers rebates to eligible residents for the purchase of a rain barrel, compost bin or native plants and trees after they participate in an in-person workshop or an online course and quiz. The rebate program re-starts each year. Therefore, residents that participated and received a rebate the previous year can partic ipate again in the current year to receive another rebate. 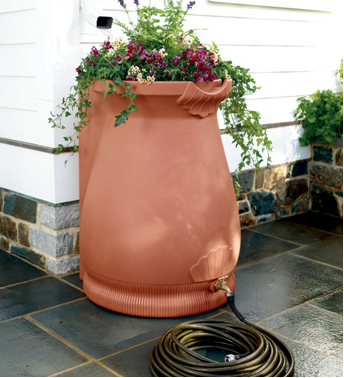 The low-cost rain barrel that is available to Gahanna residents through the program is an attractive, terracotta colored barrel with a lid that can be reversed to hold summer flowers. The barrel has a diverter that installs easily in a downspout and eliminates overflow problems. Compost or mulch yard waste. Don’t leave it in the street or sweep into storm drains or streams. Use lawn care products (ie: fertilizer, herbicides, and pesticides) sparingly. Plant trees and vegetation. The root system stabilized the ground and thus slowing runoff and erosion. Properly dispose of household hazardous waste (ie: engine oils, paints, pesticides, etc), yard waste, pet waste and kitchen grease. Never dump anything into storm drains and sewers (it is illegal). Keep drainage ditch and swales free of debris, litter and obstructions. Wash cars at a commercial wash or over areas of gravel or grass. Sweep debris from sidewalks and driveways rather than washing debris away. Report hazardous spills, illegal dumping, blockages, and unusual odors. For more tips on preventing stormwater pollution go to Project Clean Rivers.